Weigela Victoria provides great contrast in the garden with its deep coloured purple-bronze foliage and pink trumpet-shaped blooms. Flowering form late spring into summer bees and butterflies will undoubtedly be attracted by the necter rich flowers. Upright in habit and easy to maintain this is perfect for adding to any mixed border. Flowers May-June and August. Height 100-150cm. Supplied in a 7.5-10 litre pot. 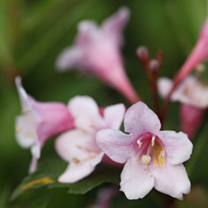 Weigela Victoria provides great contrast in the garden with its deep coloured purple-bronze foliage and pink trumpet-shaped blooms. Flowering form late spring into summer bees and butterflies will undoubtedly be attracted by the necter rich flowers. Upright in habit and easy to maintain this is perfect for adding to any mixed border. Flowers May-June and August. Height 100-150cm. Supplied in a 3 litre pot or 7.5-10 litre pot.